1. Drag and drop your video files to the program, or click the “+” button at the bottom left to load your video files. You can import more than one file for batch conversions. 2. Click the “Settings” button at the bottom to select the output video format. Video Converter HD Pro provides diverse optimized profiles such as Apple iPhone/iPad/iPod, Android Phones/Tablets, and other HD or common video formats. 3. Hit the “Start” button, which will pop up and ask you to select the output directory. Choose one, and then it will complete the conversion. 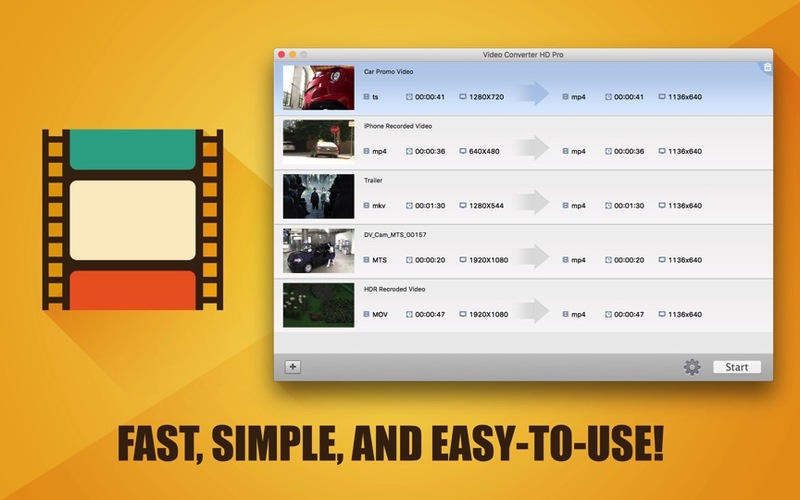 • Converts all video formats, including videos shot by iPhone, other smartphones, or DVs. • Supports batch conversion so that you can import multiple files to convert. • Optimized profiles for various devices that facilitate the conversion process. • More advanced video/audio parameters (video codec, aspect ratio, bit rate, frame rate, size, audio codec, channel, sample rate) are available for professional users.